Kevin: I like the idea of this episode, I just wish they had pushed the concept a little more or had a more explicit discussion of the biology and psychology of attraction and love. As a straight drama, it functions fine. 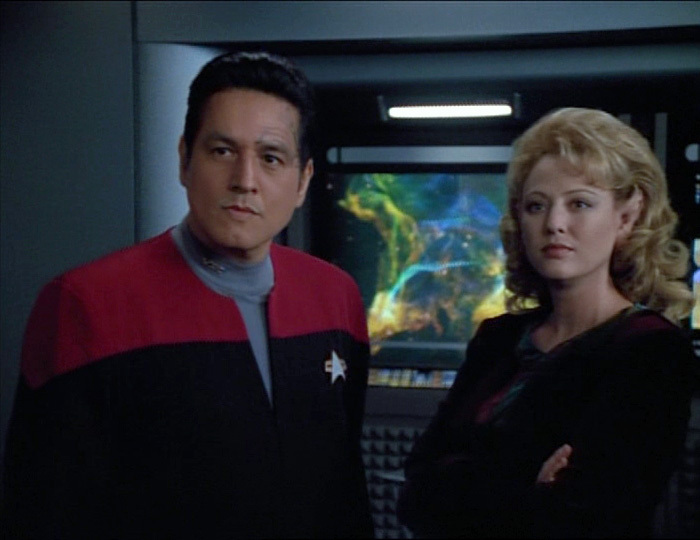 Chakotay and Kellin have sufficient chemistry to give your standard doomed romance drama the right amount of sting. That said, so much of attraction and relationships is seemingly random chance. I think you could meet the same person on two different days and end up with two different results. I suppose I don't believe in "fate" when it comes to love, and I think science backs me up here, so it would have been fun to see Chakotay acknowledge that there's no reason he should fall again for Kellin but still find himself doing so. Matthew: I did not buy in the slightest why the Voyager crew was helping Kellin at all. She's basically a security person for a repressive regime, hunting down people who it would seem that a Starfleet crew would want to grant asylum to. The explanation we're given is that "Captain Janeway wasn't too happy about having a stowaway, so she offered to help." This ethical disconnect also undermines my appreciation for Chakotay and Kellin as a couple. Kevin: I think what helps keep the episode moving is the eventual flip of Chakotay trying to sell Kellin on a relationship she can no longer remember. It helps cement Chakotay's feelings and it's a good scene to watch. A lot of this is acting which I'll get to below, but the love story itself was certainly invested with enough credibility and warmth to sustain it through any issues you may have with the set up. I also liked the touch of writing the notes on paper to himself. It does raise the question why other escapees don't start making luddite records, but I'm glad they at least thought of the issue. Matthew: I thought the paper writing actually raised more questions than it answered. Is every such record that a person makes so subject to computer integration that it can also be eradicated by a computer virus? What about transmissible infections or venereal diseases? But yeah, the emotional story of Chakotay losing this relationship just as he had come to appreciate it (again) was solid. I think they should have played up the notion that, given time, she would fall for him again, just based on chemistry. It would have made it even tougher on the characters. Kevin: The mechanism for the forgetting is just this side of too cute to function. I would have almost preferred that it were a "Men In Black" style technology rather than a biological thing since that's just a little too artful for its own good. It does also raise the question of what happens to people who successfully escape. How could you live with perpetually Memento-ing people all the time? Matthew: Yes, a technological method would have satisfied me more than an evolved one, at least one with as threadbare an explanation as this one. Tell us how it benefited their ancient ancestors, please! Do other animals on this planet share the same abilities? What part of their environment, what predators, spurred this adaptation? Kevin: This is what really carries the episode. Beltran is engaged in a way he can not be when it's more technobabble heavy. I buy his arc from skepticism to attraction to love. Virginia Madsen had a lovely warmth to her character that passes a necessary hurdle many female love interests have not in this franchise. She's engaging and intelligent in a way that makes it credible someone could fall for her twice. Matthew: I definitely agree that acting is the highlight here. Madsen is totally believable as someone a hero character could fall for, and her switch upon mind-wiping was effectively done. Beltran gets more to do here than he's had since "Year of Hell," and he does a good (but not great in my book) job with the material. Kevin: The makeup department consciously chose not to cover Virginia Madsen's face and that was a smart call. The ears accentuate her already heart shaped face. Much like Terry Farrell and Famke Jansen's spots, the make-up ends up flattering an already attractive woman. Also, it feels like there have been a more than usual share of Westmoreheads recently. Beyond that, the space battles were pretty average fare for me. Matthew: The ears were forgettable. The clothes were, as well. The pace battles were well done, but no ship designs were particularly noteworthy. All in all, one of the more bottle-show shows we've gotten. Kevin: This is a solid 3. A tightening of the mechanism or some deeper exploration of the nature of love and attraction beyond a button from Neelix could push this to a four, but the three should not be interpreted as a slight. It's a well done episode that succeeds in anchoring itself on the warm chemistry of the leads. Matthew: I found this one a little bit draggy for significant stretches, and the story logic is just head-scratching enough for me to give this a 2. I want to like it more than I usually end up doing. And, ironically enough, it ends up being a very forgettable episode. That makes our total a 5. I dont by Chakotay's arc from skepticism to love at all. I thought it was ridiculous. Like sure, people fall deeply in love with someone they met 5 minutes ago. That was really lame and cliche. I can imagine him falling in lust with her cause she is gorgeous but LOVE? Someone he cant remember and for all intent and purposes just met. And then the way he tried to get her back "for our love". Urgh. Please. You barely know her. I did not buy it at all.